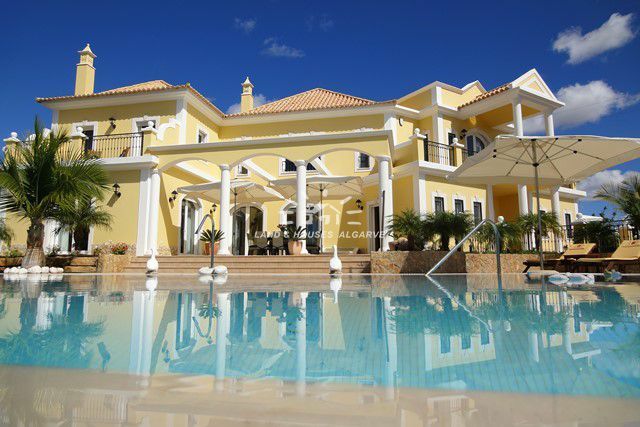 This immaculate 4 / 5 bedroom villa with stunning country and sea views and located just above Vilamoura has been built to the very highest specifications. 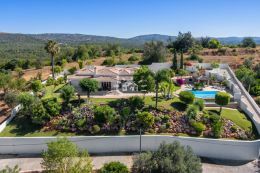 The villa sits behind a fully fenced and secure plot of 3805m2 and is built over 3 levels with stairs and an elevator that access all levels of the property. 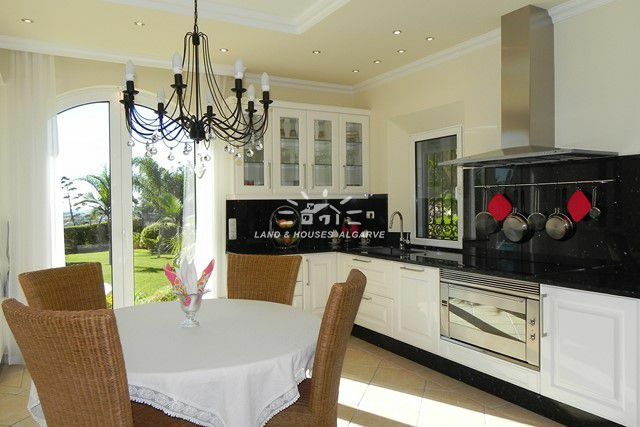 The ground floor consists of high quality spacious fitted kitchen ideal for entertaining, a living room with separate dining area both of which overlook the pool and gardens, an en suite bedroom , an office, a sauna and bathroom and a guest apartment with living room, office, preinstalled kitchen, bedroom and bathroom. The first floor has two stunning south facing bedrooms, both en suite and both with access to the terrace. 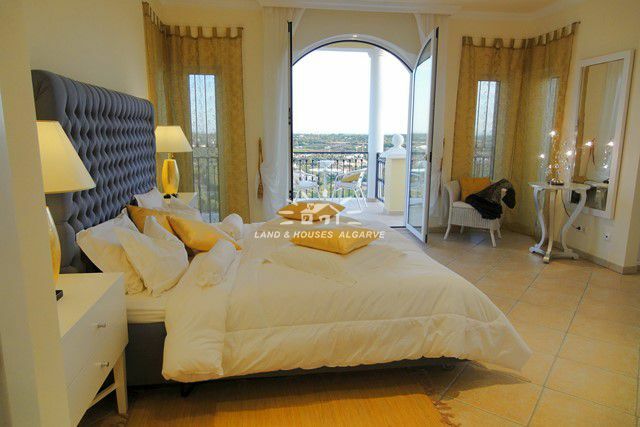 The private roof terrace is accessed via the master bathrooms patio windows. The basement offers a preinstalled cinema room that is currently being used as an entertainment area with bar, a bathroom, a double garage, a laundry room and plenty of storage. 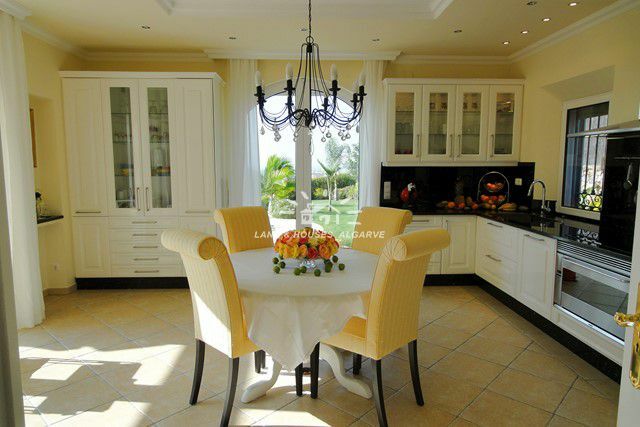 Externally the property boasts an infinity saltwater pool with water fall, assorted and numerous fruit trees in a beautifully landscaped garden, and a 15m2 wooden house with electricity and a 5th bedroom. 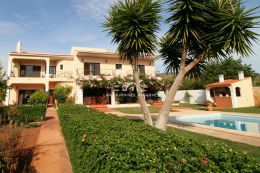 This is a magnificent property that needs to be viewed in order to appreciate the full list of quality specifications.